We are loctated in The Warner Business Center on Canoga Ave., just south of Victory, by the Hilton Hotel. If you're looking for the one restaurant the whole family can enjoy, your search is over--BJ's Restaurant & Brewhouse is the place for with something for everyone. Come relax in our inviting atmosphere and enjoy quick and enthusiastic service by our dedicated team. We combine great flavors with easy dining as part of how we're always Pursuing Amazing™! Are you hungry for something different? At BJ's Restaurant & Brewhouse, we have over 120 menu items that are all created with quality and care. It started right here in California with our breakthrough Signature Deep Dish Pizza. From there, we kept creating California comfort food like our handcrafted burgers, pasta favorites, specialty entrees, and more. You can eat smart with our BJ's EnLIGHTened Entrees and indulge in our desserts like the legendary Pizookie®! No matter what you're craving, you'll find something to love at BJ's Restaurant & Brewhouse. As Californians, we're crazy about our craft beer. If you love taste of handcrafted brews, you'll love our selection of suds on tap at BJ's. We feature 10 signature beers that always on tap as well as rotating seasonal and specialty beers. Whether you prefer the intensity of the Tatonka® Stout or the refreshing drinkability of the LightSwitch® Lager, we'll help you find the perfect beer to pair with your meal. 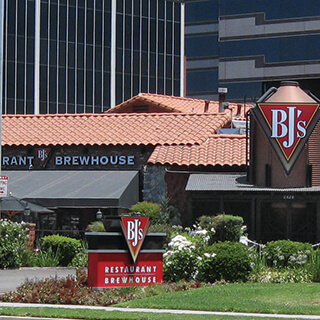 Find the intersection of science and art with a craft beer at BJ's Restaurant & Brewhouse in Woodland Hills! At BJ's Restaurant & Brewhouse, you're welcome to enjoy your evening with us. Come watch the game or sit back for a family meal and we'll be happy to serve you. Our full menu, unique craft beer, and committed staff make it easy to see how we're Pursuing Amazing™ here at BJ's in Woodland Hills. We have been a community favorite for over 17 years. We are known for our fun bar atmosphere, rustic charm, and great banquet facilities!